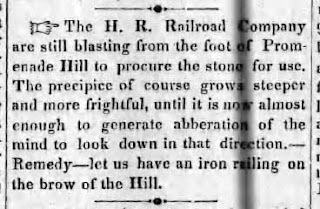 Last week, Gossips published a little item from the Hudson Daily Star for April 30, 1851, which explained why Promenade Hill had recently grown "steeper and more frightful" and called for an iron railing to be erected to prevent people from tumbling down the precipice. A month later, the call for a railing was taken up by a visitor to Hudson, identified only as "Iron Pen," in a letter to the editor that appeared in the Star on May 22, 1851. The railing was one of four "improvements that are necessary to the welfare of [the City's] affairs" recommended in the letter. 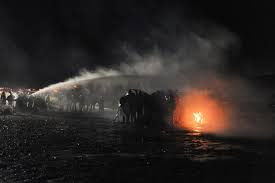 That the City be lighted during the Dark Nights, and that the Recorder and Mr. Kellogg be a Committee to Direct the construction of, and the place for, the Lamps, not exceeding Twenty in number, and are to provide Oil, and agree with Suitable persons to light the same. Although today we think of every night as a dark night, it seems that in 1798, "Dark Nights" were determined by the phases of the Moon. Apparently only those nights when the moon was new qualified as "Dark Nights," and it appears this practice may have continued in 1851. 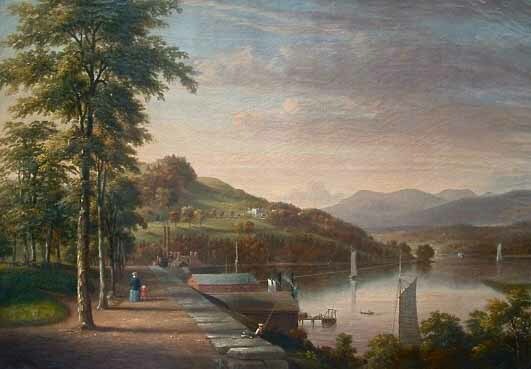 In 1851, Hudson was probably on the brink to pursuing the letter's fourth recommendation that "a City Hall should be erected, one that Hudson city would be proud of." As we know, in 1855, construction of the building that was originally City Hall, which we now know as the Hudson Opera House, was completed. 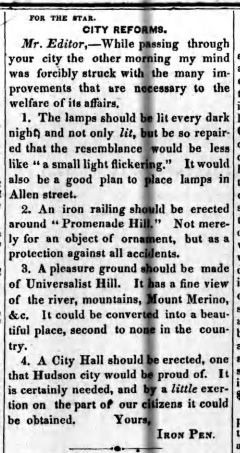 The recommendation that Universalist Hill should be made a "pleasure ground" raises the question: Where was Universalist Hill? 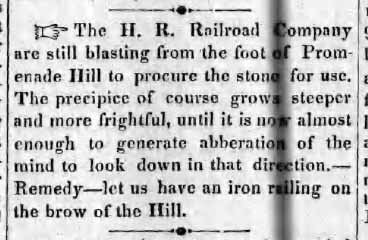 A letter to the editor of the Hudson Daily Register, dated October 7, 1881, and signed simply M., explains what part of Hudson was called Universalist Hill, or Universal Hill. [Universal Hill] was a broad, beautiful green, fronting the bay, extending from the old church edifice on Third street, which was the only building upon it, nearly to Second street, Allen street, between these points was then little more than a rough road, known as Federal or Church street. . . .
Universal Hill was the great resort for circuses and shows of every description, with an occasional militia "training." By affording as it did a beautiful outlook upon the broad bay and river, it was especially popular as a play ground for boys, an after tea resort for mothers and children, and as a summer evening resort for scores who seated upon the green grass until a late hour drank in the pure, cool breezes wafted from the bay, with no fear of malaria to molest or make afraid. It was a point, too, which was always crowded to watch the incoming and outgoing whale ships. There was a movement at one time made to preserve this as a city park, but it encountered great discouragement from each end of the city as a central project and never got beyond the period of "talk." Third Street was not yet extended when this hill is remembered as in its best condition. Only a cow path led down to the South bay road. The reference to malaria is explained elsewhere in the letter, where the writer, in 1881, bemoans the degradation of South Bay. During the last few years the South bay has often been noticed from a sanitary point of view. Dr. P[orter]'s pleasant article calls it back to my mind as I remember it in the days of my boyhood, a bright feature in the landscape, whose charms so thickly cluster about our city. Looking at it to-day, unsightly, overgrown with rank vegetation, what is left of it filled with mud and filth, fringed with railroad tracks and breeding malaria, only they whose memories go back over a considerable period can realize that is was ever a "thing of beauty.". . . .
No description given of the South bay to-day will convey to the reader an idea of its beauty as seen from the hill described when the rays of the setting sun fell, as they often did, upon an unruffled sheet of water unbroken from the western shore of the river to the road which skirted it on the East. Mt. Merino was then much more densely wooded than to-day and the road leading thence into the city, around the bay, thickly fringed with elms and willows. On the hill, at the end of Second street, the spacious old Presbyterian Church looked gravely down upon the scene, and the town clock sent its echoes over the quiet waters. This Saturday, the Hudson Farmers Market reopens for the month of December in a new location: Hudson Lodge, 601 Union Street. Today, Hudson's other farmers market, the Upstreet Market, which in the warmer months sets up in Seventh Street Park every Wednesday afternoon, begins its pre-holiday run in HFM's former winter location: the Fellowship Hall of Christ Church Episcopal, 431 Union Street. From 4 to 7 p.m. today and every Wednesday between now and Christmas, vendors will be offering diverse and unique food and craft items. There will also a table of "gently used" household items, the purchase of which will benefit the church's outreach program. So, brave the dink and the dank of this last damp, drizzly November day, and come out to shop for your holiday giving and entertaining needs at the "Upstreet Market" Holiday Craft and Market Fair. The event begins at 6 p.m. Click here for more information. All the absentee ballots from the November 8 election have now been counted, and we now have the final word on the overwhelming success of Proposition One, the proposition to adopt wards of equal population and do away with the weighted vote in the Common Council. The chart below shows how votes were cast in each of the existing wards. 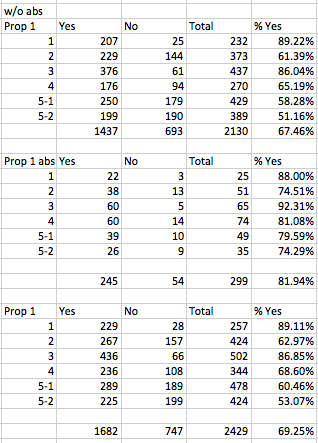 With both ballots cast at the polls and absentee ballots, Proposition One passed in every ward, but the margins were greater in absentee ballots. Eighty-two percent of the voters who submitted absentee ballots voted yes on Proposition One as compared with 67.5 percent who voted yes on Proposition One at the polls. Gossips has just received word, which originated in Assemblymember Didi Barrett's office, that Governor Andrew Cuomo has signed into law the bill authorizing the City of Hudson to collect a lodging tax. Following Up: As we know, Governor Cuomo had 133 bills on his desk to be signed or vetoed before midnight last night. The Times Union reports on which he approved and which he vetoed: "Cuomo vetoes more than 70 bills, signs roughly 60." 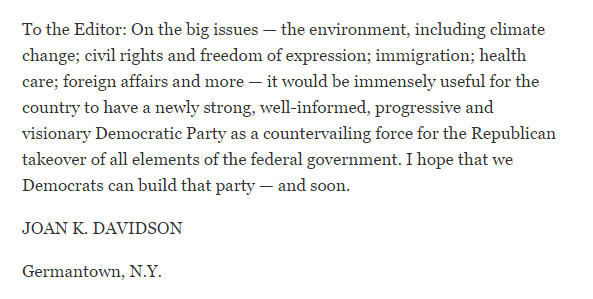 Happily for Hudson, our lodging tax bill was among those he approved. There were no new posts yesterday because Gossips got completely distracted reading a new novel by Byrne Fone, author of Historic Hudson: An Architectural Portrait. Back in the early years of the 21st century, many people said they were writing murder mysteries set in Hudson. More than a decade later, Fone is the first--probably the only-- one to follow through. 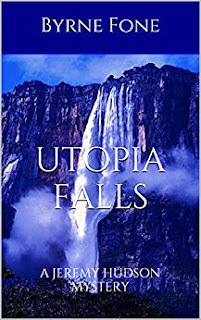 Gossips learned early yesterday morning, from the author himself, that, in the esteemed 19th-century tradition initiated by Charles Dickens, he had published the first installment of Utopia Falls: A Jeremy Hudson Mystery on Amazon Kindle. For a mere 99 cents, anyone who has any kind of electronic device--it doesn't have to be a Kindle--can read this book in progress. 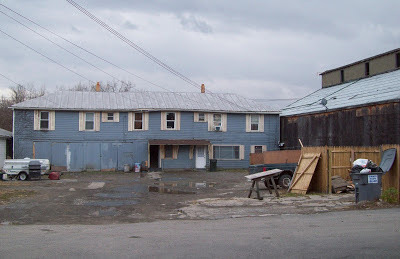 Here's a quote from the author's description of the book: "When a series of brutal murders rocks the calm of the small upstate town of Utopia Falls, where native inhabitants--'Old Falls'--who have lived in the Falls for generations bitterly resent 'New Falls' residents--straight & gay antiques dealers, artists, actors, musicians, celebrities and wealthy newcomers--who have made the once sleepy town an elegant and chic destination, Jeremy Hudson, a young writer recently arrived from New York, is determined to discover the source of this animosity and who has chosen murder to further set 'Old Falls' against 'New Falls.'" 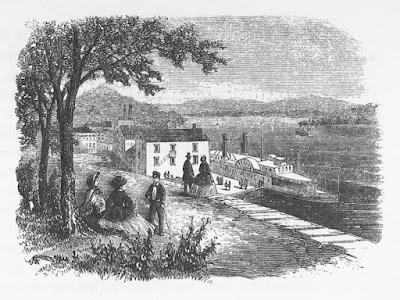 Utopia Falls is, of course, fictionalized Hudson, and a big part of what makes the book entertaining and engaging for us Hudsonians is the challenge of matching the people and places of Utopia Falls with the people and places of Hudson. Intriguing, too, is the way Fone weaves the history of Utopia Falls, discovered by his protagonist in ancient newspapers and manuscripts in the rare book room of the local library and clearly inspired by Fone's own research for Historic Hudson, into this tale of grim and brutal murder. What has been published so far is just the first installment. Fone invites readers to let him know if they want more. After reading the 216 pages now available, this reader earnestly hopes that Fone will finish the book. Soon after mentioning the Hudson Iron Works in the post about Walter Ritchie's upcoming lecture, I came upon this little item in the Hudson Daily Star for May 22, 1851. Both the iron works, which were designed by Charles C. Alger, and Alger's home at 59 Allen Street were being constructed in 1851. 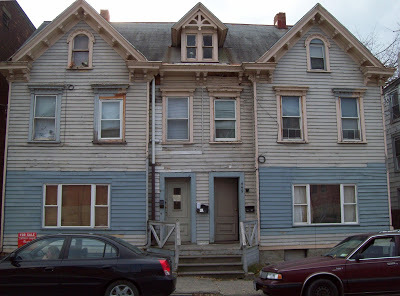 On Thursday, December 1, as part of the Local History Speaker Series at the Hudson Area Library, Walter G. Ritchie will present his research on 59 Allen Street. 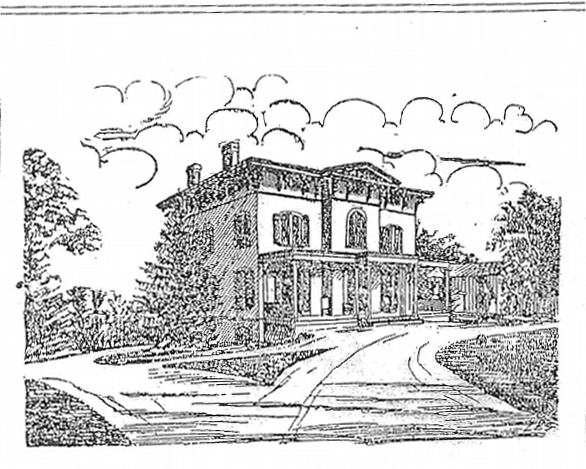 The lecture, entitled "The Hudson Residence of Charles C. Alger and His Patronage of Alexander Jackson Davis," will not only explore the history and design of the house but also the life and associations of its original owner, Charles C. Alger. 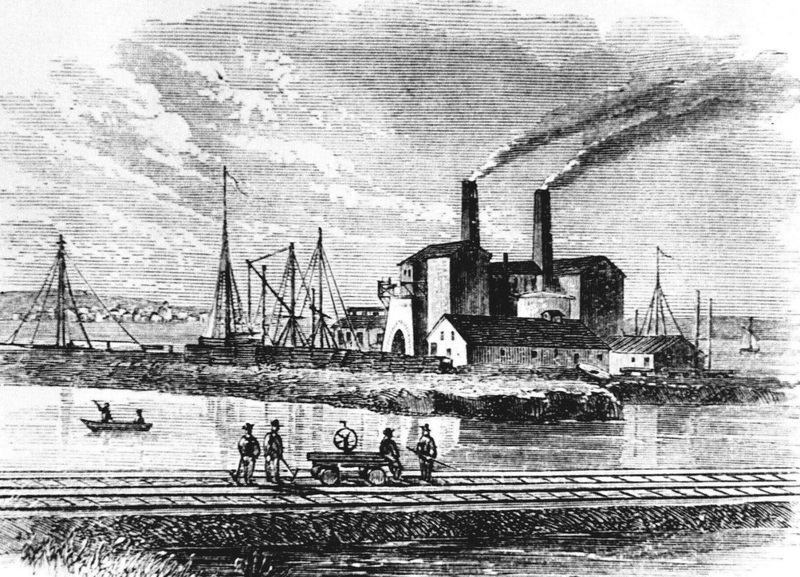 Alger was the designer of the Hudson Iron Works, and, from his home at 59 Allen Street, he had a commanding view of the blast furnaces at the water's edge. Alger's Gothic Revival brick house was built in 1851, "embellished with wood bargeboards, finials, and eared drip moldings." It was a well-known landmark in the 19th and 20th centuries and remains so today, despite its now neglected state. Ritchie's lecture will reveal many of the original architectural details that survive in the house today. 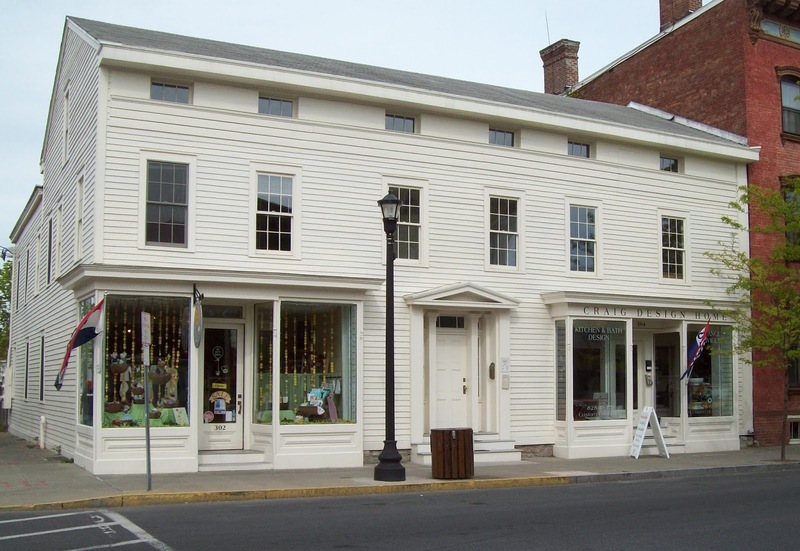 It will also discuss Alger's Newburgh and New York City residences and the work done at both those properties by the architect Alexander Jackson Davis, best known in Hudson for his work at the Dr. Oliver Bronson House. 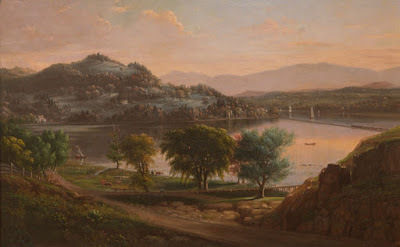 In his lecture, Ritchie will also detail Alger's extensive collection of works by significant 19th-century American painters and sculptors, including Hudson River School painter Sanford R. Gifford. The lecture begins at 6 p.m. on Thursday in the Community Room at the Hudson Area Library, 51 North Fifth Street. 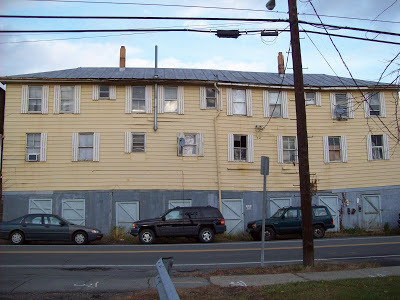 Six years ago, in November 2010, Gossips published an inventory of all the buildings owned by Phil Gellert, the emperor of the notorious (in Hudson. at least) Northern Empire. At that time, there were twenty, and one of them was 718-720 Union Street. The proposal to demolish 718-720 Union Street, presented recently to the Historic Preservation Commission by the person who intends to buy the building, inspired Gossips to revisit some of the other properties that have in the past six years passed out of Gellert ownership. 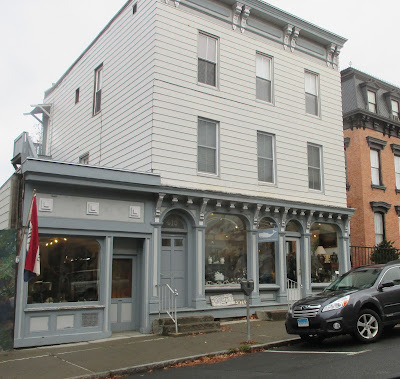 The first is 408-410 Warren Street. This building gained some notoriety back in 2011 when a dropped ceiling fell, sending occupants of the apartment below to the hospital. In 2013, new owners of the building, the proprietors of White Whale, stripped away the plywood and other weirdness obscuring the building's intended design and restored the storefront to its original glory. Another building that is finding new life after Gellert ownership is 102-104 North Fifth Street, the house that was, from 1893 until 1900, the original Hudson City Hospital. In August 2015, the house was purchased from Gellert by Kamal Elmasri, who is now completing a remarkable restoration of the historic house. 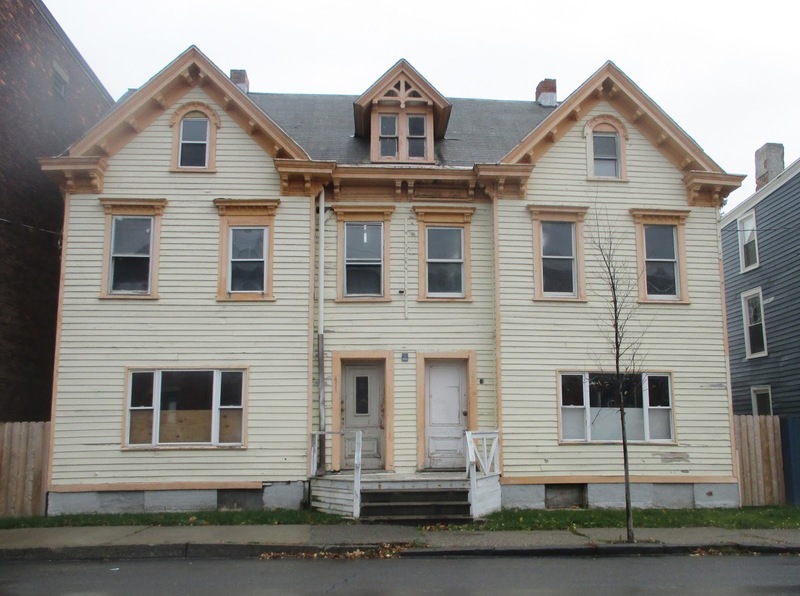 Another property that has moved out of Gellert ownership and is on its way to better things is 449-451 State Street. This poor, sad double house was purchased from Gellert at the beginning of 2015 by someone who cleaned up the interior and got it ready for resale. Now it seems the building has been sold again, and the hope is that the new owner will restore it to its original design, before those dreadful "picture windows" were installed on the first floor. Some guidance in what was meant to be may be found in the background of this picture. As far as the rest of the Gellert Gallery is concerned, several of the buildings are currently for sale, notably 432 Warren Street, 221-225 Allen Street, and 29 Eighth Street, all deserving, in Gossips opinion, rescue and restoration. 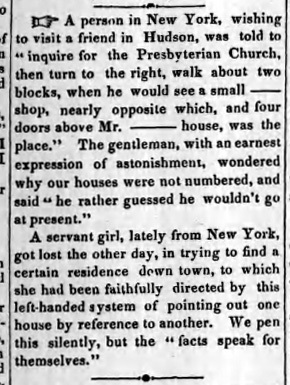 Recently, while doing research in Hudson newspapers from 1851, it struck me that the location of houses and businesses is never indicated by an address but rather by its relation to a well known building or business. 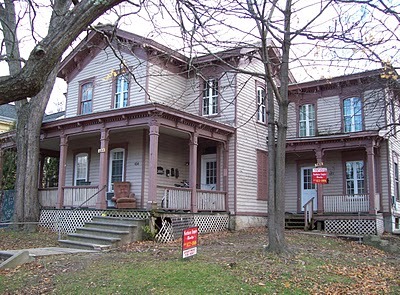 For example, a house advertised for sale on Allen Street was said to be "a few rods from the Court House." 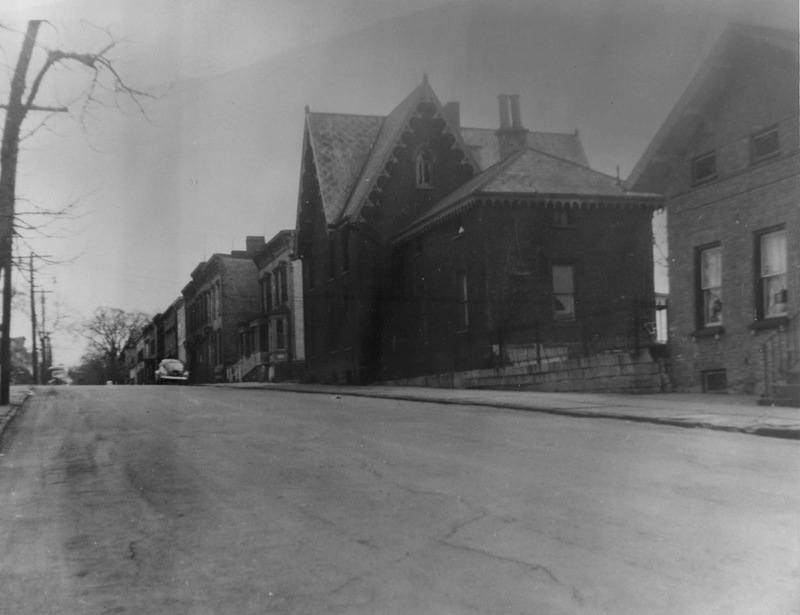 Mrs. Bushnell announced that she had opened a boarding house "in the A. Hammond Building, fronting the Public Square." A barber informed his patrons that "he will continue to SHAVE and DRESS HAIR as usual at his stand in Warren street, directly opposite H. Gage's Crockery Store, and two doors below Bogardus & White's Grocery Store." An advertisement for E. Simpson, Physician and Surgeon, told those seeking his services: "His house can be found a few doors above the Mansion House, and nearly opposite the Presbyterian Church." Yet another ad announced that secondhand pianos where to be had at "Blanchard's, a few doors below Badgley's Hotel, Warren street." 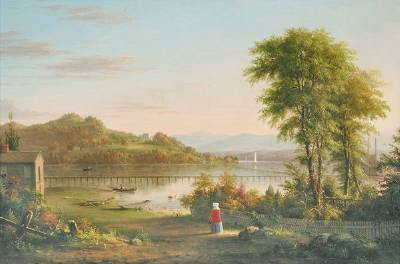 The reason for this bizarre manner of indicating location is intimated in this little item, which appeared in May 1851 in the Hudson Daily Star. 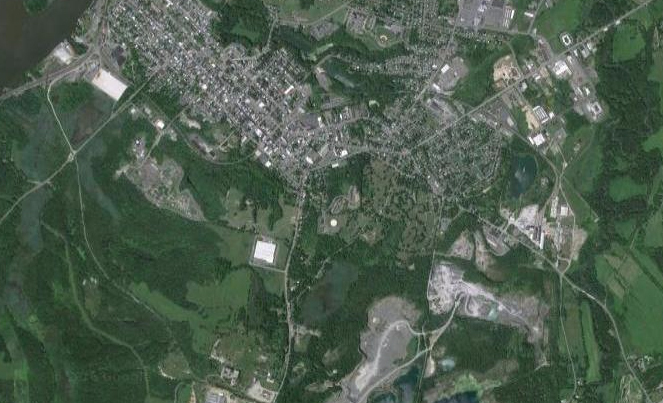 It appears that in 1851 houses and buildings in Hudson were not numbered. It is not known exactly when house numbers started being used in Hudson. It's entirely possible that the editorializing item in the Star was part of an effort to get Hudson to conform with what was done in the rest of the country. Soon after, in 1854, ads start appearing in the Star that give the addresses of businesses. The following is an example. 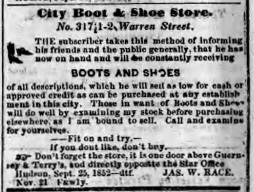 The headline for this ad indicates City Boot & Shoe Store is located at 317½ Warren Street. But old habits die hard, and at the end of the ad, readers are reminded that the store is "one door above Guernsey & Terry's, and directly opposite the Star Office." It appears that sometime in the mid-19th century--between 1851 and 1854, when the city had already been in existence for some seventy years--Hudson decided to adopt and use house numbers. Thirty-five years later--from 1888-1889--it was decided to change all the numbers on the city's west-east streets in order to introduce "hundred blocks." All done, we can assume, to make researching a building's history more challenging for us in the 21st century. At the Planning Board meeting on November 10, it was announced that the Department of Environmental Conservation had named the Greenport Planning Board as lead agency in reviewing the proposed Colarusso haul road from the quarry to the waterfront. At the time, Planning Board chair Tom DePietro indicated that the choice was made because "more of the project is in Greenport." More than two weeks after the Planning Board meeting, the letter from DEC that informs the planning boards of the decision and explains the rationale is now available online. The letter explains that three criteria are used in resolving a lead agency dispute. The first is: "whether the anticipated impacts of the action being considered are primarily of statewide, regional, or local significance (i.e., if such impacts are of primarily local significance, all other considerations being equal, the local agency involved will be lead agency)." Discussing this criterion, the letter states: "The City Planning Board argues that the City would be more affected by a change in traffic patterns. The City also argues that the anticipated change in traffic patterns would have a potentially negative impact on its waterfront and at the Basilica--which the City indicates is an important venue for arts, entertainment and weddings. However, the existing truck route is also close to the Basilica and the City is not specific about how changes associated with the haul road project would impact its waterfront differently since the Project Sponsor's trucks already use the waterfront to barge its materials." The second criterion is: "which agency has the broadest governmental powers for investigation of the impacts of the proposed action." Discussing this criterion, the letter states: "The City Planning Board indicates that there is some question as to whether the proposed haul road is in conflict with the City's zoning. However, the City Planning Board does not offer any specific information on this issue for guiding consideration of the City Planning Board's potential jurisdiction." There is a third criterion as well: "which agency has the greatest capability for providing the most thorough environmental assessment of the proposed action." The letter does not discuss this criterion because "a designation of lead agency can be made without replying on this third criterion." The designation favored by the first and second criteria is that the Greenport Planning Board be the lead agency. 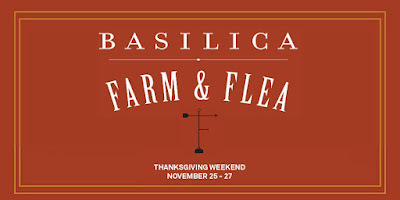 Basilica Farm & Flea Holiday Market opens today at 2 p.m. for a three-hour Early Bird Kick-Off. Following that, from 5 to 9 p.m., is the Black Friday Soiree (with cocktails). The market continues on Saturday and Sunday, from 10 a.m. to 6 p.m. and from 10 a.m. to 5 p.m. respectively. 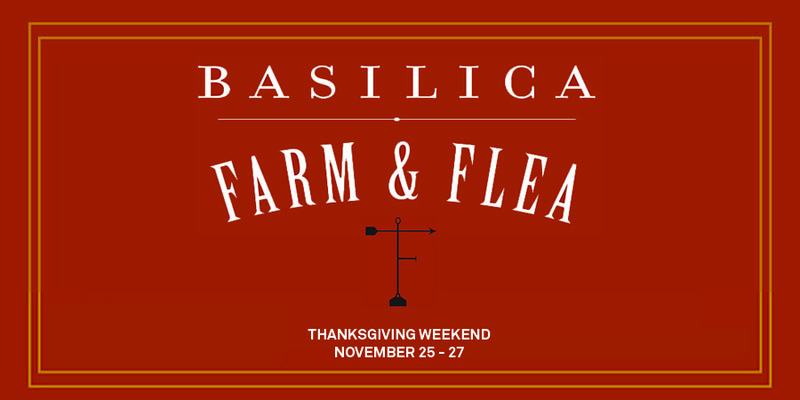 In preparation for holiday giving and entertaining, visitors can shop for handmade and vintage goods, purchase locally made food products, and enjoy farm-fresh food while doing so. Click here for more information. Early images of Promenade Hill show the park without a railing along the edge. 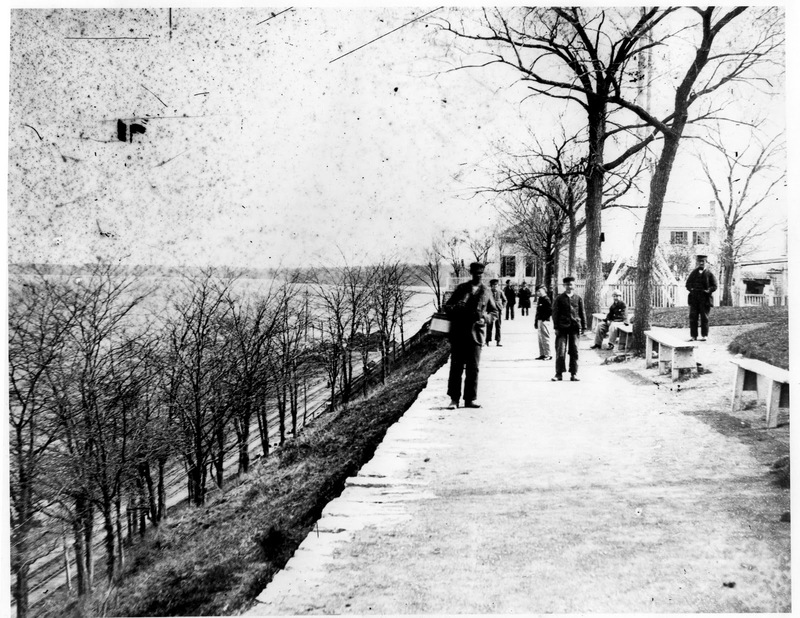 We know from Anna Bradbury's History of the City of Hudson that it was 1878 when "the authorities took measures to improve the Promenade Hill, by the erection of an ornamental iron fence along the full length of its dangerous frontage." 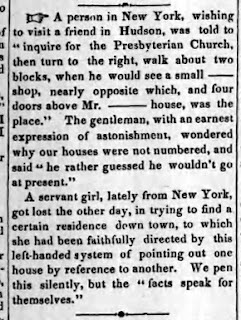 This little news item, discovered in the Hudson Daily Star for April 30, 1851, explains why a fence might have been required when it hadn't been before and reveals that the need for such a fence was recognized more than a quarter century before it was actually built. Twenty-seven years to provide a barrier to prevent people from tumbling down the frightful precipice. By comparison, the time it is taking the City to solve the problem of providing a handicapped ramp to Promenade Hill that is sensitive to the design of the historic landscape hardly seems extraordinary. While more and more hotels are proposed for Hudson, the City awaits word on whether or not our proposed lodging tax will be approved in Albany. The legislation authorizing the tax passed in the State Senate and Assembly last summer, but it was only delivered to Governor Andrew Cuomo's desk, to be signed into law or vetoed, on Wednesday, November 16. According to an article that appeared in the Times Union on Wednesday, it seems our lodging tax bill was one of several that were sent to the governor's desk in the days just before Thanksgiving: "133 bills await action by Cuomo." There is speculation--denied by those involved--that inundating the governor with bills needing his attention just before the holiday weekend was retribution for his blocking a pay raise for legislators. The governor has until Monday, November 28, to act on each bill. If he takes no action, a bill automatically becomes law. Rouse yourself from your tryptophan stupor long enough to make sure your car is parked on the odd side of the street tonight. Sam Pratt just shared the news, first reported by Riverkeeper, that a decision by the New York State Court of Appeals effectively stops the Nuclear Regulatory Commission from re-licensing Indian Point. A statement from Riverkeeper President Paul Gallay reads in part: "The Coastal Zone Management Act gives the New York Secretary of State the authority to refuse certification of any project that significantly impacts river resources. 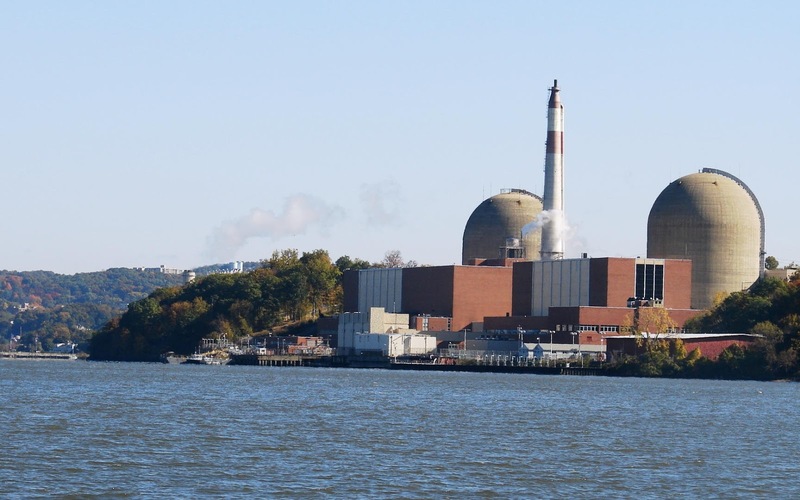 In late 2015, the Secretary of State ruled that Indian Point was inconsistent with over a dozen policies designed to protect the Hudson River and its surrounding communities." Pratt notes that these Coastal Policies are the same regulations that ended the St. Lawrence Cement project. 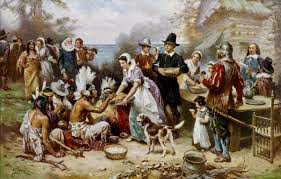 Tonight, the eve of Thanksgiving, overnight parking is permitted on BOTH sides of the street. But it's only for tonight. Tomorrow night, alternate side of the street overnight parking is back in effect. Soon after today's "Ear to the Ground" was published, a reader referred me to the Capital Region Economic Development Council 2016 Progress Report, which was released early last month. 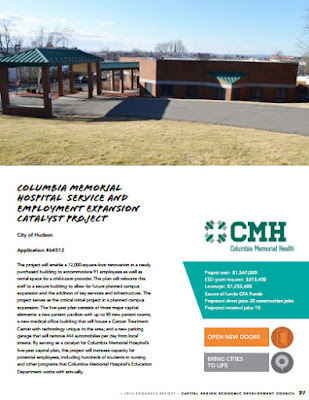 There, on page 71, in a section entitled "2016 Proposed Priority Projects," was the description of a five-year capital plan for Columbia Memorial Hospital, or Columbia Memorial Health, which seems to be what the H in CMH now stands for. The project will enable a 12,000-square-foot renovation in a newly purchased building to accommodate 91 employees as well as rental space for a child-care provider. The plan will relocate this staff to a secure building to allow for future planned campus expansion and the addition of key services and infrastructure. The project serves as the critical initial project in a planned campus expansion. The five-year plan consists of three major capital elements: a new patient pavilion with up to 90 new patient rooms; a new medical office building that will house a Cancer Treatment Center with technology unique to the area; and a new parking garage that will remove 444 automobiles per day from local streets. By serving as a catalyst for Columbia Memorial Hospital’s five-year capital plan, this project will increase capacity for potential employees, including hundreds of students in nursing and other programs that Columbia Memorial Hospital's Education Department works with annually. 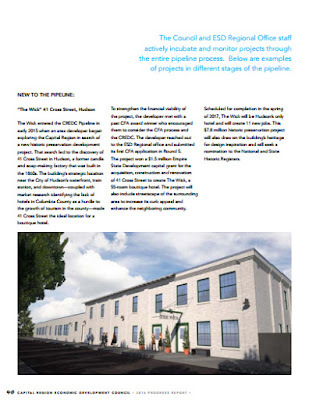 The "newly purchased building" is the one pictured on the page. There is no clue where they intend to build the "new patient pavilion" or the "new medical office building that will house a Cancer Treatment Center," or what will happen to Cavell House, currently the location of New York Oncology and Hematology, when that new building has been constructed. Cavell House, named for the heroic British nurse Edith Louisa Cavell, was constructed as a private residence at the beginning of the 19th century. 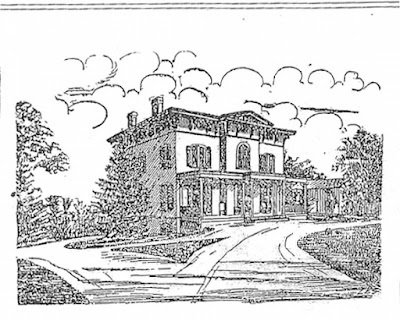 In 1918, its owner at the time, Dr. John Conover Smock, donated the house to Hudson City Hospital for convalescing World War I soldiers and sailors. Twenty years ago, CMH wanted to demolish Cavell House to expand a parking lot. The entire history of the house can be read in the documents nominating the house for local landmark status. For the curious, the CREDC 2016 Progress Report makes interesting reading. Page 40, in a section called "Implementation of 2016 State Priorities," is devoted to The Wick, the 55-room hotel being created at 41 Cross Street. The most intriguing item appears on page 83, also in the section devoted to "2016 Proposed Priority Projects." 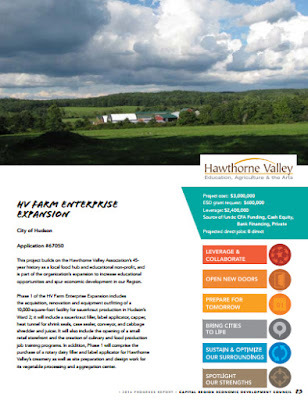 It is a project called "HV Farm Enterprise Expansion." Phase 1 of the HV Farm Enterprise Expansion includes the acquisition, renovation and equipment outfitting of a 10,000-square-foot facility for sauerkraut production in Hudson’s Ward 2; it will include a sauerkraut filler, label applicator, capper, heat tunnel for shrink seals, case sealer, conveyor, and cabbage shredder and juicer. It will also include the opening of a small retail storefront and the creation of culinary and food production job training programs. 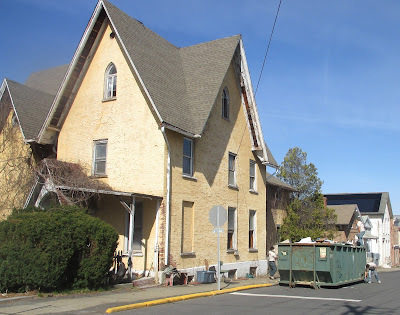 The question is: What building with 10,000 square feet in the Second Ward is Hawthorne Valley Farm planning to acquire, renovate, and equip for the purpose of producing sauerkraut and create therein a small retail storefront? This falls into the category of "Be Careful What You Wish For." Although still a rumor, Gossips has heard it often enough to think it may have some credibility. We all know that parking at Columbia Memorial Hospital has been a problem for people living in the surrounding neighborhoods, so much so that it inspired Mayor William Hallenbeck, back in 2014, to come up with a parking permit plan intended to prevent hospital workers and visitors to the hospital from taking the onstreet parking places used by neighborhood residents. That plan evolved into Local Law No. 1 for 2015. It's been months since anything has been heard about this legislation, which was withdrawn from the Common Council's consideration by Council president Don Moore on November 2015, and which current Council president Claudia DeStefano suggested in March 2016 should be resurrected. Meanwhile, it seems CMH may be contemplating its own solution to the parking problems: constructing another parking garage on the site of the former Eden Park Nursing Home with an enclosed walkway passing over Prospect Avenue, connecting the parking structure with the main hospital building. A memorial gathering for Ruth will be held Monday, November 28 with calling hours from 4 to 6 p.m. at the Bates & Anderson-Redmond & Keeler Funeral Home, 110 Green Street, Hudson. Anyone who knew Ruth is welcome to pay their respects and perhaps share an anecdote or two. In lieu of flowers, a donation may be made to Community Hospice of Columbia/Greene Counties, Catskill, New York, or to the non-profit dog rescue, Midogrescue Foundation, Inc., Westerlo, New York. 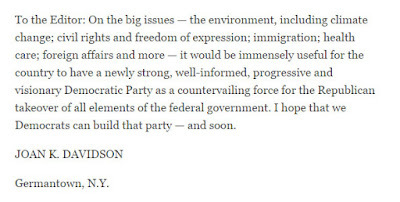 In Sunday's New York Times, several letters to the editor, analyzing what went wrong in this year's election and offering ideas for how the Democratic party can move forward, were published under the title "Why the Democrats Lost." 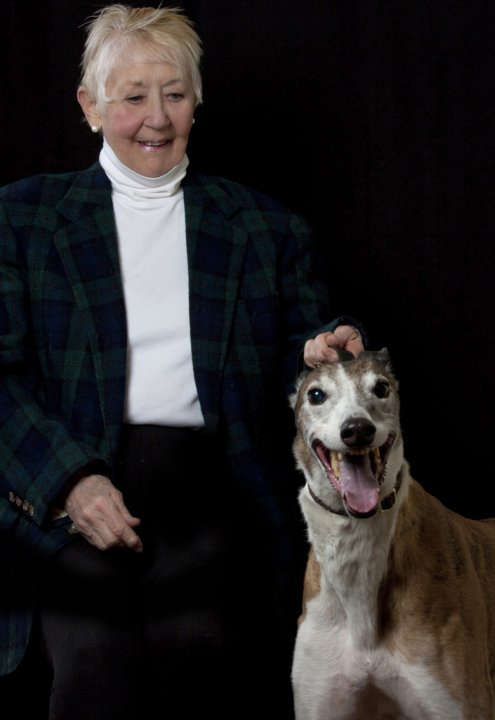 Among them was a letter from someone familiar to many of us: Joan K. Davidson. 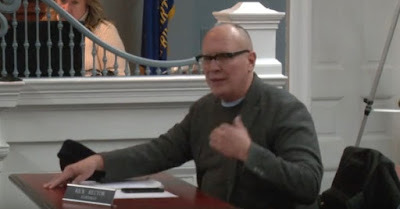 Dan Udell's video of last night's Common Council meeting, convened to approve the 2017 budget but taken up with a somewhat contentious discussion about financing the handicapped ramp proposed for Promenade Hill, can now be viewed online by clicking here. 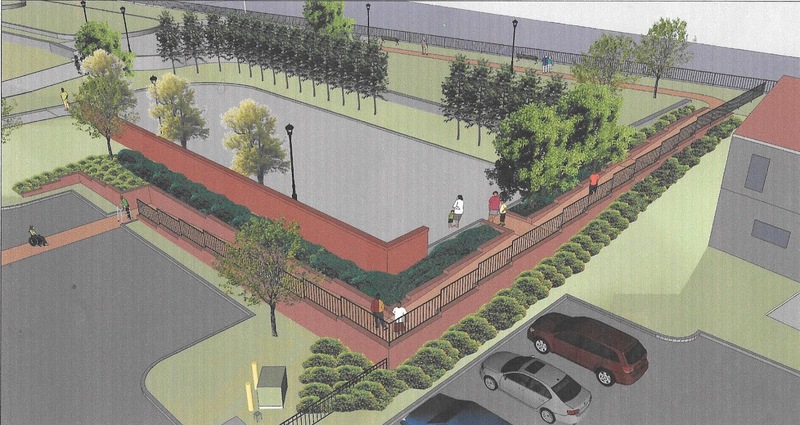 Tonight, there was a special meeting of Common Council to approve the 2017 budget, but the discussion was all about the ramp proposed for Promenade Hill, a pet project of Second Ward aldermen Abdus Miah and Tiffany Garriga. It will be recalled that a year ago, when the City failed to get a grant that would have funded the design and construction of a ramp at Promenade Hill, it seemed the Council was committed to building a temporary ramp with the $20,000 that had been allocated for the purpose in the 2015 budget. 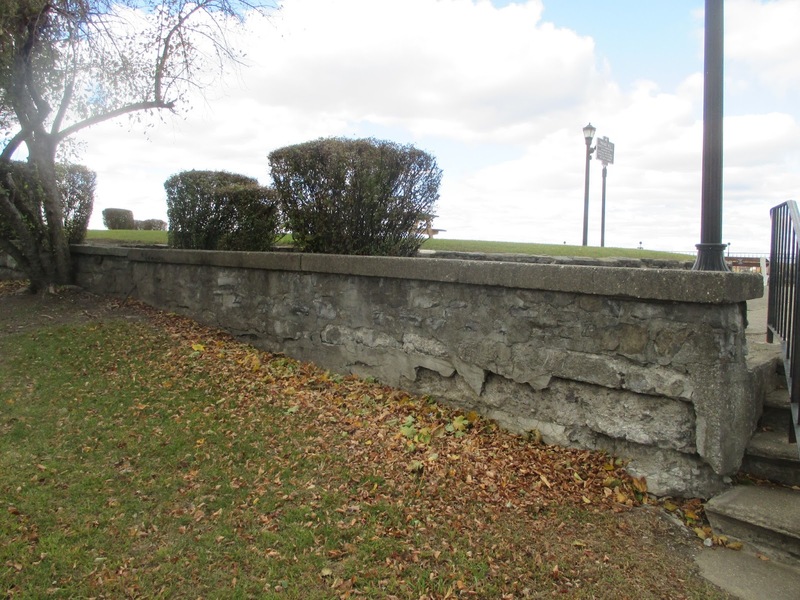 This spring, to spare our most historic park from being defaced by an unsightly temporary ramp, a landscape architect was hired to design a ramp that would be a sensitive addition to the historic landscape. The money to hire the landscape architect was provided by the Mrs. Greenthumbs Hedge Fund. Through the spring and summer, a group of people--representatives of the Mrs. Greenthumbs Hedge Fund, the mayor, and Garriga--worked with the landscape architect to conceptualize and approve the design and to select the materials to be used. These renderings show the design for a ramp that originates in the parking lot behind the Chamber of Commerce and continues along the border between the park and the northern half of Hudson Terrace. Although the retaining wall for the ramp appears to be red brick in these conceptual drawings, the material that was chosen for the retaining wall is block that pays homage to the historic stone retaining walls rather than trying to imitate the red brick walls that are part of the 1970s design for the entrance. The design for ramp at Promenade Hill was supposed to be presented to the Historic Preservation Commission by the mayor and Garriga this past Friday, November 18, but at the last minute--so last minute that the landscape architect showed up for the meeting with her presentation boards--the project was withdrawn from the agenda. The reason was the estimated cost of the ramp was about $155,000, and the City had only $60,000 to pay for it. So, here's how the ramp and the 2017 budget are connected. It will be remembered that $100,000 had been written into the proposed budget for 2017 for legal fees to defend the City against a lawsuit that would likely follow if Proposition 1, the Fair & Equal proposal, had not passed. Since it did pass, this money presumably will not be needed, so in an email to the mayor this morning, Miah proposed that, of the $100,000 contingency, $80,000 be allocated for the ramp and $20,000 be set aside for a "low income affordable housing project study." It was this proposal, which apparently had the support of the mayor, that was the cause of contention at tonight's special Common Council meeting. After the resolution to accept the budget was introduced, Alderman John Friedman (Third Ward) brought up the question of the $100,000 contingency. Alderman Rick Rector (First Ward) suggested that the money remain in the budget as a contingency, and the Council could decide what to do with it later. "It's a conversation we can have and should have publicly." Garriga argued that the Council should decide now what the $100,000 is a contingency for, and Miah declared that the Council had a moral obligation to allocate the money for the handicapped ramp. Friedman noted that it had been "less than a week" since it was known that the $100,000 would not be needed for legal fees and "there has been zero public conversation about this issue." He suggested that the $100,000 "can either go back into the general fund, or we can allocate it later." He also cautioned, "It's not free money, and it's not found money. We're lucky we didn't have to spend it on litigation." Rector complained that no one on the Council had seen the plans for the ramp except Garriga. "I'm not going to vote on something when I don't know what it's going to look like." He also indicated that he would support a housing study for Hudson but not one that focused only on low-income housing. "We should fund a study that shows what all our [housing] needs will be." Alderman Alexis Keith (Fourth Ward) asked, "Can we just agree to set this money aside, and have this conversation [about how to use it] later?" Rector moved to put the $100,000 in a contingency and determine its use later. When the motion to approve the 2017 budget was finally made, the resolution passed with only Miah voting against it. 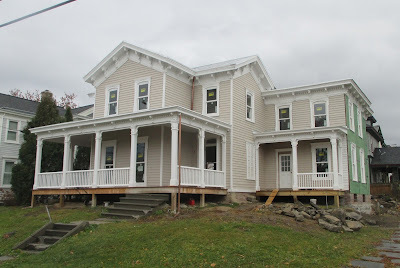 More than a year ago, Gossips reported on plans to convert Benson House, one of the most remarkably well-preserved and lovingly restored houses in Hudson, into a four-room boutique hotel. Since then the plans for a hotel have expanded and evolved. 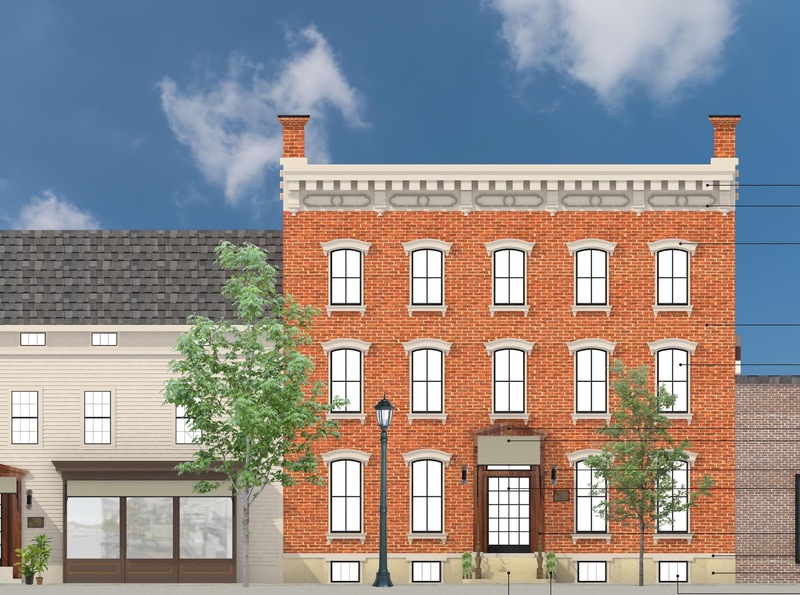 The hotel will now include the building next door, 302-304 Warren Street, and will have eleven rooms: four luxury suites at 306 Warren and seven rooms at 302-304 Warren Street. 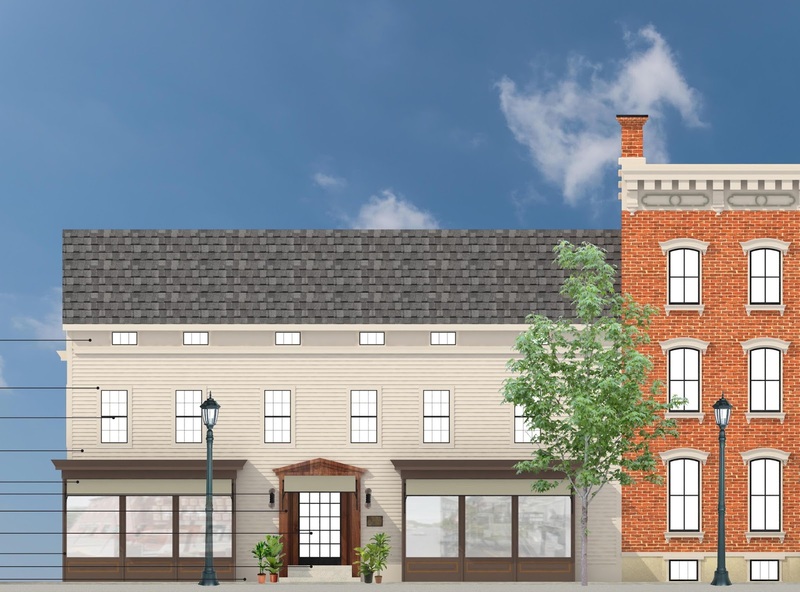 The proposed exterior alterations to the buildings, to ready them for their new life as a hotel, were presented to the Historic Preservation Commission on Friday. 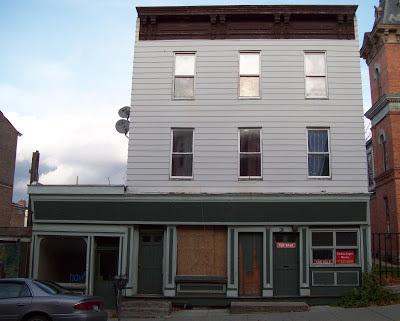 At 302-304 Warren Street, where a new storefront was created not that long ago to replicate the one that already existed, the facade is to be altered to accommodate a secondary hotel reception area. The storefront entry bays will be infilled with windows, the door surround will be stripped of paint and given a dark stain, the door will be replaced with a custom-made multi-light door, and an awning will be hung over the door. 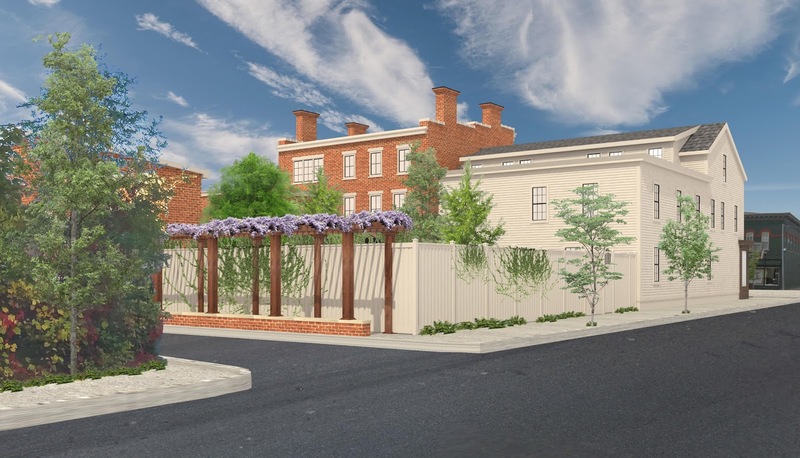 At the back, a shed dormer the width of the building will be added, together with a fence surrounding the hotel's pool and a pergola covering a walkway along Prison Alley that leads to the carriage house behind 306 Warren Street, which will become a bar and lounge. Even though 302-304 Warren Street is one of the oldest surviving buildings in Hudson, dating from the end of the 18th century, the HPC was less concerned with the changes proposed for this building than they were with the changes proposed for 306 Warren Street, because of its historically intact condition. The changes proposed for 306 Warren Street involve replacing all the windows, replacing the double front doors with a new door, replacing the brownstone stoop with a new limestone stoop, replacing the railings, putting a limestone veneer on the foundation, and installing an awning over the door to match the one proposed for the entrance to 302-304 Warren Street. HPC member Miranda Barry was concerned that the proposed awning obscured the door surround. Architect member Kate Johns had more comprehensive concerns. 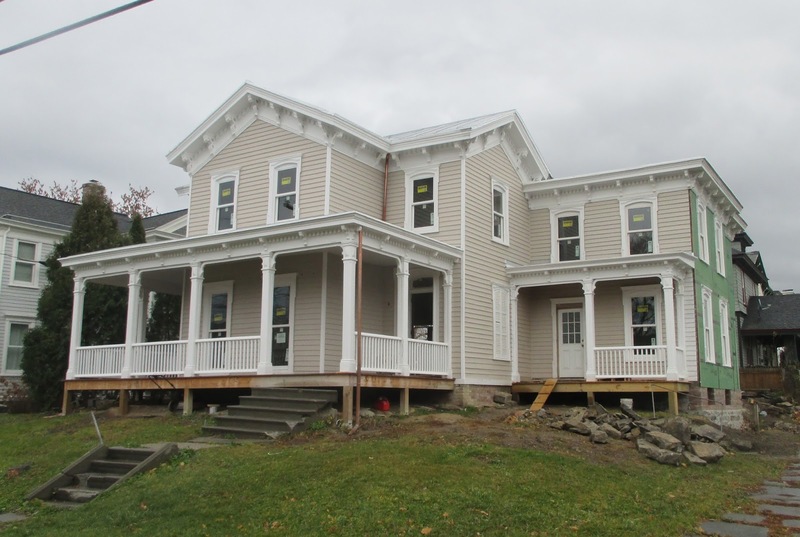 The windows, the doors, the stoop, the railings--all of the things proposed to be replaced--are original to the house and should be repaired and retained rather than replaced. She acknowledged that the brick on the foundation appeared different from the brick of the rest of the house and suggested that it may have originally had parging to make it look like brownstone, to match the stoop. She urged the applicants to consider incorporating the original double doors into the new design for the entrance. She also asked the applicants to consider restoring the original windows rather than replacing them. The applicants agreed to consider Johns' requests, as well as Barry's request that the awning not obscure the door surround. Kristal Heinz, attorney for the applicants, asked if, since all the issues the HPC had with the project were with 306 Warren Street not with 302-304 Warren Street, the application could be split and the HPC could approve what was proposed for 302-304 Warren so that construction could begin on that part of project. 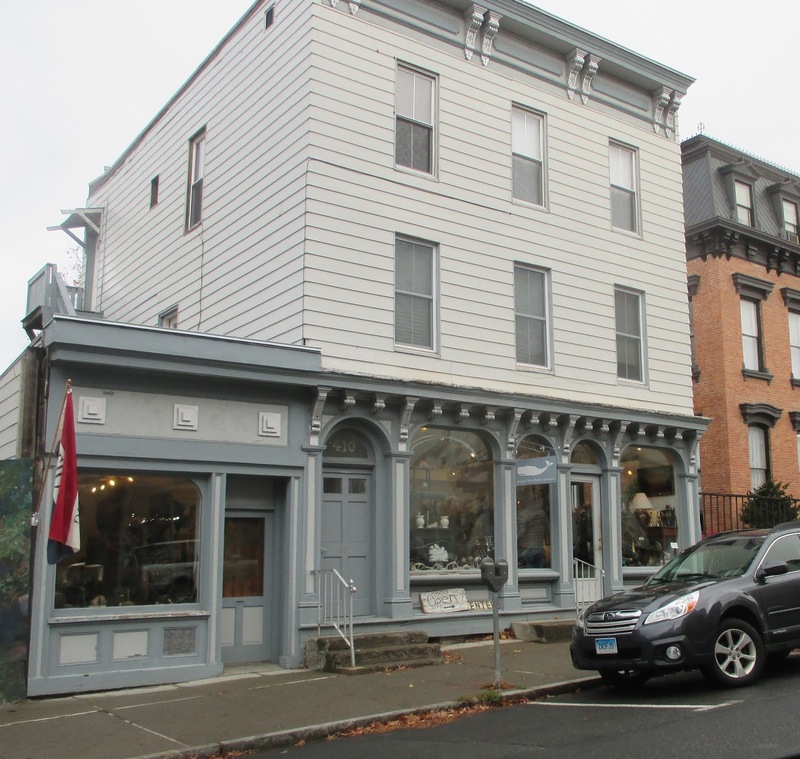 This was agreeable to the HPC, which voted unanimously to approve what was proposed for 302-304 Warren Street. The project will likely come back before th HPC at its next meeting on December 9.